The LA Galaxy once again have a brand new attacking system, and it has yielded six goals in two games. In a recent article, Mathew Doyle lays out the bare essentials of LA’s new formation. Of course we should be careful about drawing conclusions based solely on two games. For now, I’ll try my best to refrain from making any sweeping assertions — but there are a few observations to be made. Over the last few games, the Galaxy have moved the ball extremely well down the left hand side. 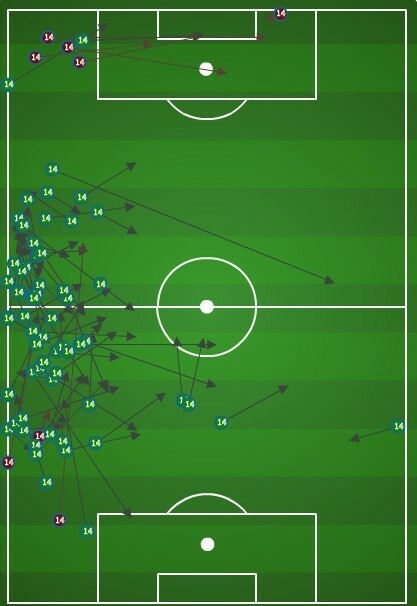 In the Portland game, Robbie Rogers and Landon Donovan combined for almost ¼ of the team’s total passes. 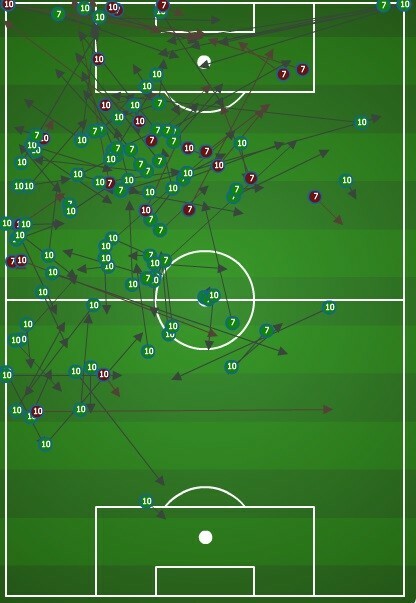 In fact, the only Galaxy player with more passes than Rogers or Donovan was Juninho, who had 87 passes, 57 coming from the left. Thus far LA’s dominance down the left hand side has been due to the success of Landon Donovan as an inverted winger, as well as width of Robbie Rogers. Over the last few games, Landon Donovan has found success as an inverted left midfielder. As an inverted winger he’s put consistent pressure on the lb/lcb channel, and reconnected with his beloved partner in crime, Robbie Keane, with whom he often seemingly shares a singular soccer brain. 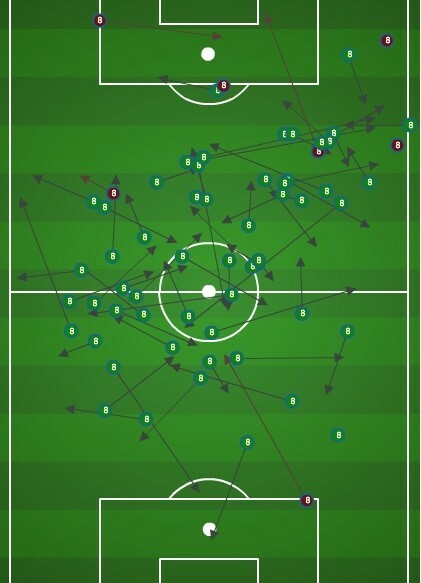 As can be seen from the combined passing charts of Robbie Keane and Landon Donovan, when Landon Donovan pinches in, and Robbie Keane drops back, their passing areas overlap perfectly, creating plenty of opportunities for that quick combination play that has made the pair so deadly over the years. As a follow-up to a previous article in which I compared Landon Donovan’s chance creation numbers at CAM vs FWD, I have added his numbers as an inverted winger in the following chart. Although there isn’t quite enough data as with the other positions, Donovan’s chance creation numbers as an inverted winger do appear to be back to the elite levels we expect from him. In fact, even if Donovan plays two full games as an inverted winger and doesn’t create a single chance, he would still be a full 1.23 chances per 90 better than his average at CAM. At left mid Donovan has found more room to run at defenders than he did as a CAM. Donovan’s ability to create chances on the move is probably the most important part of his game, and the reason why he is such an elite chance-creator as a withdrawn forward and inverted winger, and such a poor CAM, where he distributes far less while sprinting. Rogers was also able to let off five crosses. Only one found its target — but luckily that target was Gyasi Zardes, who is burying nearly everything he sees at the moment. And this brings us to the final aspect of LA’s success in this new system thus far. Under the tutelage of Robbie Keane, and thanks to lots of hard work after practice working on finishing drills, Gyasi Zardes has turned into one the league’s premier finishers. Here is how his conversion rate stacks up against the league’s top 5 leading goal scorers this year. For a more accurate comparison, I have left out penalty kicks. Can LA continue their form in this new Y-midfield formation? Again, it’s dangerous to draw conclusions from a limited set of games, but there is no denying that the numbers are promising. With Seattle dropping points in their last two games, the Galaxy find themselves in prime position to challenge Seattle and Sporting Kansas City for the Supporters Shield. Hold on to your hats, people. It’s about to get interesting.